What is OMG Dessert Goals? 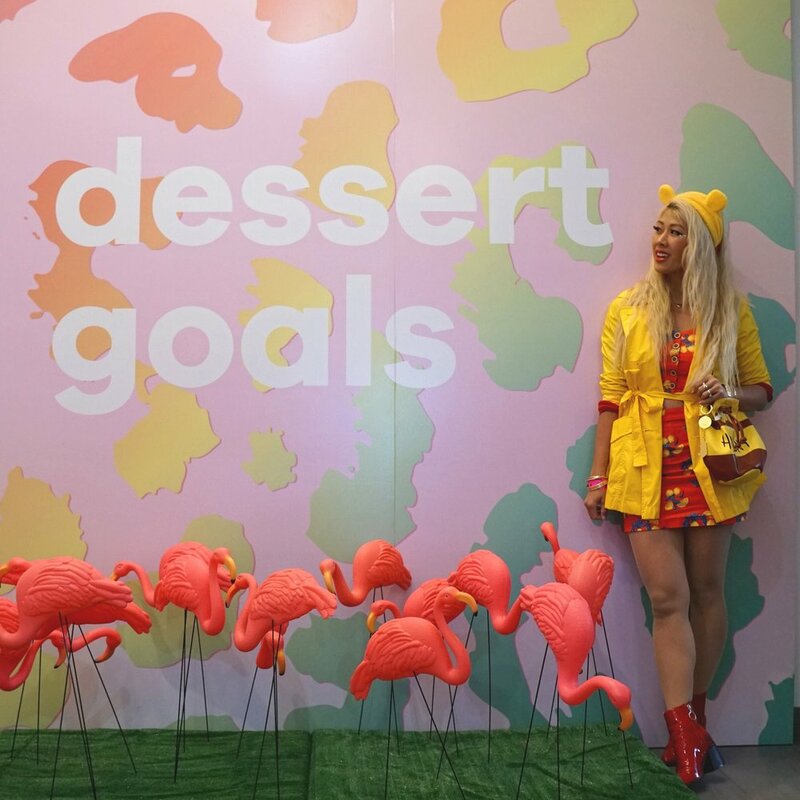 If you’ve been following my blog, this was my second time attending this dessert convention held in Long Island City for an entire weekend. Last fall I attended their fall edition after winning contest tickets (which you can read about here), and this time around, I was extended an invitation to their spring reiteration. It was set in the same location as last time; a big warehouse alongside the river that you’d never even know was housing all these delicious goodies til you walked in. This time, I got lucky and found street parking a few blocks away from the location. Otherwise, getting here is a little tricky by train since weekend subway schedules in NYC are a little sketchy and it is definitely a bit of walk to get here. This is probably the one thing I would like to see improved regarding the event. While the location doesn’t deter event goers - each session sold out! - it would have been nice to be easier to get to and locate with more signage and decoration as you arrive up to the gate. It looks like a big shipping warehouse from the outside so you might miss it entirely if it weren’t for the crowd of sugar rush junkies lining up. Although! In its one defense, as you exit the warehouse, it is a beautiful spot for a great view of the Manhattan skyline! I attended this year with my sisters and my mom! This was my mom’s first Instagram event with me, so she was able to see how I worked when I go to events like this. She probably thinks I’m nuts, haha. My sisters attended last year with me so we had our gameplan of divide and conquer. We’d scout all the booths first and then figure out what we’d want to purchase to sample. It also helps to go with a group so that you can buy one dessert at each booth and share, so that you can all sample a little bit of everything. Tickets range from $12 to $55 depending on what time slot you chose to go, and if you wanted any extras. The Sugar Rush tickets come with more time and a gift bag, and the night tickets gave you a preview of the event and had alcohol/alcohol infused desserts available. I attended the early bird slot, which I prefer (despite not being a morning person) because it gives you first dibs on all the goods available there. It’s also the cheapest admission price, and in my opinion, the best bang for your buck. The Sugar Rush is $35 and only 30 minutes longer and the goods inside the gift bag I honestly didn’t feel justified the extra pricing. Just like last year, with every admission, you get a few free things. Your wristband has tickets you exchange for free water from Boxed Water, free candy from Sour Punch and Red Vines(Last year was a Sugarfina candy station but this time they handed out a pre-made candy bag which was probably better since it got rid of a long line that you would’ve had to wait on to put together your goodie bag.) and free mochi from My/Mo Mochi ice cream, which was also improved since the last event by offering more flavors, last year there was only one. There was also a salt bar which gave out free chips and snacks to cleanse your palate between the sugar rushes. The salt bar this time around though I felt was not as good as last year since there were only two items available and you were limited to those two bags of chips. Last year there were several items you could choose from and you could take as many as you wanted. But granted the vendors change, and this was this year’s offerings. The room this time around felt less congested than last years which was really nice. I actually arrived a little late since I was searching for parking but I still had more than enough time to enjoy everything, and it still didn’t feel stuffy and the lines weren’t too long for any one booth. I was worried at first as I was running late since I was there early last year and felt like I didn’t have enough time to try everything and gram everything. These are the vendors we ended up sampling from. Rebecca’s Cake Pops - they were there last fall and again, they were a hit. There’s always a line but this time they were plenty stocked and prepared to handle it and it moved fast and much smoother. The cake pops were also in theme with Party Animals theme of the event. If you haven’t heard of Rebecca’s, they are the most adorable, cutest Instagrammable treat of the whole place! I love this vendor because of how great the customer service is, curating each order personally and making sure it’s perfect to your liking. Stache of Goods - I’ve seen these all over my feed but this is the first time I’ve actually got to try them! This vendor doesn’t have a physical storefront, but she takes orders for pick-up in NYC and makes the most adorable, custom designed macarons with fun characters, shapes and flavors. She was so sweet to my entire family as my sister tried to buy out her entire table of Pusheen themed macarons to feed her Pusheen obsession. Oddfellows Ice Cream Co. - I’ve actually been walking by this place several times on my NYC adventures but never had a minute to stop in. The presentation isn’t as appealing to me because it’s just balls of scooped ice cream so I never stopped to check it out. This was my first chance and their sprinkled decorated flavor was pretty good. Baked In Color - I love anything rainbow so these rainbow chocolate chip cookies were my cup of tea. They were so soft and so fresh too! The baker was so sweet in chatting with my family while I grammed away. I ended up taking them to work the next day and they were absolutely delicious. I had to stop myself from eating the whole jar. Eight Turn Crepe - I’m not a big fan of crepes all the time because sometimes it’s just too much sugar for me but these were really good. They also make savory crepes, but they didn’t have them on site for this event. I would love to stop by their storefront later this summer and try more. They remind me of the cute crepe cones from Japan. I miss Japan’s perfection of street food looking exactly like their displays. Stax - I’m bias about this vendor because I love them. I’ve been there since they opened their storefront in Chinatown a year and a half ago. I love that they always come up with new delicious flavors and how bright their ice cream colors are. My favorite flavor is lychee which I’m hoping they bring back soon. They also make super adorable cakes which I also ordered last year for a birthday and it came out amazing and delicious. There were a total of 22 vendors but in an hour and a half, at a certain point your sugar tolerance tells you to stop. I was in the mood for lunch and something savory instead so I saved the rest of my appetite for later. Besides the booths, the event also had a few cute stations for your gramming needs, but honestly, they weren’t as cute or as varied as they were last time. I wasn’t feeling the displays as much so I didn’t spend too much time with them and like I said, I was strapped for time so I didn’t get to take photos of everything as our time slot was coming to a close. All in all, I enjoyed coming back to this event a lot! I look forward to returning again if they have another fall edition or rather a summer edition if they expand to more than just 2 events a year. I love the idea of sampling all the latest, new and trendiest desserts that New York has to offer in one central place. I ran into the CEO and face behind OMG Dessert Goals, Miraya. She was super sweet and remembered me from my emails. You could tell she put a lot of work and love into making this event great and and even thought of the Instagrammers with all the cute backdrops and decorations. I would definitely recommend this if you’re a foodie as well as a #forthegram foodie. It’s worth the price of admission and worth your time.